Another Kickstarter I designed has launched! AAW Games' new Rise of the Drow: Collector's Edition combines the best-selling, 5-star, ENnie-nominated Rise of the Drow book series into two massive 600+ page, collector's edition hardcover books for 5th Edition Dungeons & Dragons and Pathfinder RPG. Umbravania logo I designed for the series. 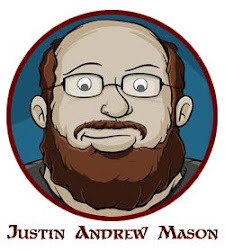 The new Gothic Horror series of adventures I am writing for AAW Game's Mini-Dungeon Monthly 5E Zine (5Ezine.com) was covered in the projects update earlier this week. You can read the full update by clicking here. Or, find out more information about this oldschool-style one-color print RPG adventure zine created especially for 5th Edition Dungeons & Dragons. This place is a dark land of gothic horror. It exists in between the tides of time, beneath the shadows, and apart from the ordinary. The mysterious fog that links the normal world with the terrors herein is a mystery, but you know with incontrovertible certainty that you have come to a place of tilted reality. This series of non-linear Mini-Dungeons riffs off of well-known classic horror themes and applies a new twist to those beloved tales. Each is a stand-alone adventure, but as a whole they bear witness to the denizens and locales of the weird and eerie realm known as Umbravania. The first installment in the series, “The Whispers in the Hollow” delves beneath the roots of the soul, where dark secrets lurk between incoherent thoughts and fear swells from the unknowable. While experimenting with antediluvian occult rituals, a dark magician accidentally summons something ancient. Devil nor demon, but a primordial entity – something from before when the stars were wrought from cosmic fire. Now beckoning tongues never intended for mortal perception wrack the magician and denizens from a nearby village with lingering confusion and madness. Are the adventurers bold enough to brave the unknowable whispers and delve into the magician’s dark lair? Can their minds withstand insanity as it steals deeper into their psyche? If they falter, who knows what terrible fate awaits them? 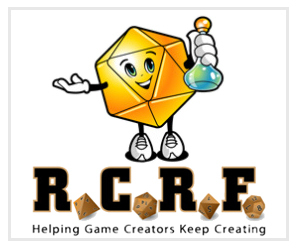 I created a new series of promotional badges for the AetherCon Online Tabletop Gaming Convention's CFWR (Cleric, Fighter, Wizard, Rogue) miniature painting competition. These will be for competing miniatures companies to display the participation and/or placing in the final contest results. Each year various miniatures companies submit their best painting themed miniatures to the contest, and attendees to the convention vote for their favorites. There's a huge prize bundle for those participating. I found out today that Paco Jean of G*M*S Magazine will be translating AAW Game's "Mini-Dungeon Tome" for publication in Spain. This is exciting news to me, because I think it's the first time my writing has ever been professionally translated to another language for publication. February 2019 Exclusive Dungeon Crate VTT Map Set Released! My exclusive February 2019 virtual tabletop map set for Dungeon Crate is ready to roll. Subscribers can find a new VTT map set and other digital goodies in every month's digital crate (included as part of the monthly subscription). 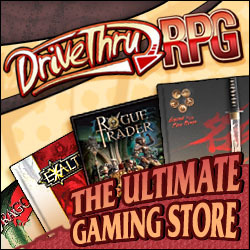 Check out DungeonCrate.com to find out more about getting a monthly box chock full of amazing tabletop RPG resources mailed directly to your doorstep. 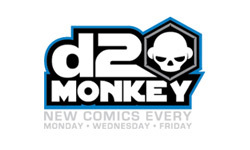 Follow me on Twitter for weekly content updates! Get the high-resolution VTT map files by clicking here! After a violent volcanic eruption, the Kingdom of Alturae lies in utter ruin. Entire villages buried under ash and pumice, forests scorched asunder, and farmlands completely consumed by carmine lava flows. Once the dust settled, and the undulating ground once again slept, more than two thirds of the kingdom had been destroyed. With nearly all resources eradicated, the Alturaen culture seemed destined to vanish. However, a single hope remains. Ytoreth, the king’s advisor and lore-keeper believes there is an artifact that can restore their lands and save the people – the Verdant Staff. Legend tells of this staff that births flora and foliage wherever it strikes, and with such magical powers, it could be used to quickly restore the decimated lands. 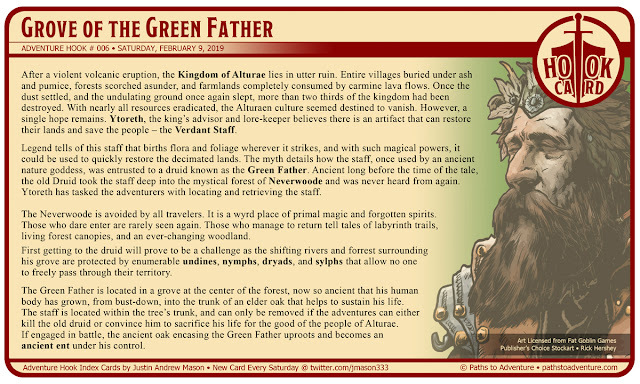 The myth details how the staff, once used by an ancient nature goddess, was entrusted to a druid known as the Green Father. Ancient long before the time of the tale, the old Druid took the staff deep into the mystical forest of Neverwoode and was never heard from again. Ytoreth has tasked the adventurers with locating and retrieving the staff. The Neverwoode is avoided by all travelers. It is a wyrd place of primal magic and forgotten spirits. Those who dare enter are rarely seen again. Those who manage to return tell tales of labyrinth trails, living forest canopies, and an ever-changing woodland. First getting to the druid will prove to be a challenge as the shifting rivers and forrest surrounding his grove are protected by enumerable undines, nymphs, dryads, and sylphs that allow no one to freely pass through their territory. 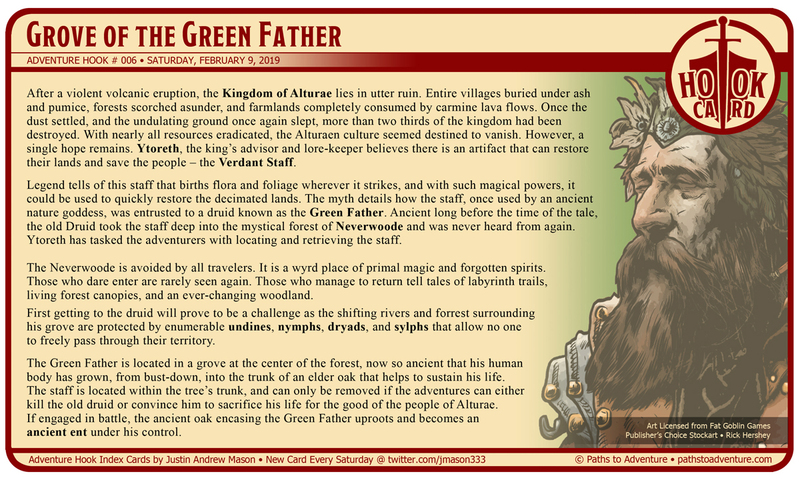 The Green Father is located in a grove at the center of the forest, now so ancient that his human body has grown, from bust-down, into the trunk of an elder oak that helps to sustain his life. The staff is located within the tree’s trunk, and can only be removed if the adventures can either kill the old druid or convince him to sacrifice his life for the good of the people of Alturae. If engaged in battle, the ancient oak encasing the Green Father uproots and becomes an ancient ent under his control. The city of Urville has become overrun with rabid rats. Verminous swarms of fur, claw, and teeth. The city’s food stocks have become tainted by feces and decay, and waterways are littered by the floating corpses of drown rodents. Many abandoned the city when the plethora of filth-related diseases arrived, migrating their families to nearby cities and villages. However, many longtime residents remain, struggling to survive and rid themselves of the seemingly never-ending populace of vicious, biting varmints. The adventurers arrive to the city to discover its calamity and are asked by Virgil Lovingood, the city’s mayor, to assist. The denizens have discerned that the rats are coming from the sewers beneath the city, but have been unable delve deep enough to find their source. The mayor hired one team of mercenaries to take care of the problem, but after entering the sewers, they were never heard from again. In truth, the source of the infestation is a psychic wererat named Henrik Helmson, though the name he prefers is “Lord of Vermin”. Henrik was passing through Urville in his human form when he was wrongfully accused of committing a murder. Tried and convicted, he was sentenced to spend the rest of his days in the city’s dungeons. Henrik broke out of his cell, converted several guards and fellow inmates into subservient wererat thralls, and escaped into the sewers. From beneath the city, Henrik utilizes his psychic abilities to control the massive population of rats, and is hell-bent on casting the city that imprisoned him to ruin. His escape and plot are unknown to the denizens of the Urville due to the utter chaos that erupted with the rats arrived. The adventurers can discern the truth and identify their enemy by disabling any of the wererat thralls; Henrik’s psychic connection to each fades when they are severely injured and near death. 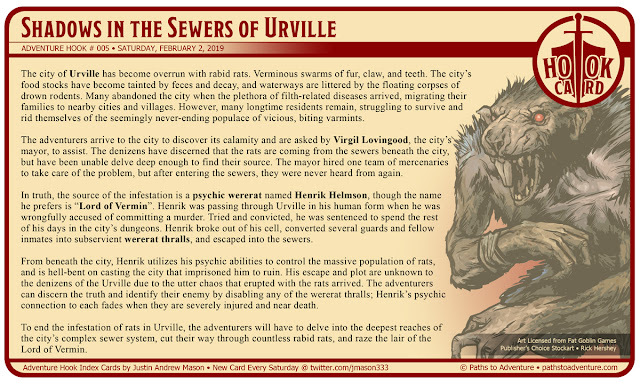 To end the infestation of rats in Urville, the adventurers will have to delve into the deepest reaches of the city’s complex sewer system, cut their way through countless rabid rats, and raze the lair of the Lord of Vermin. 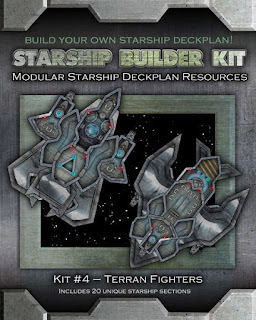 Another Kickstarter project I designed and am involved in just launched! 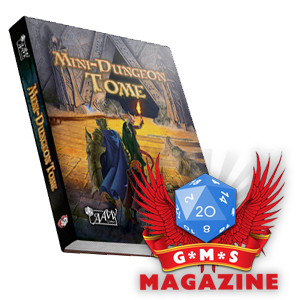 Check out AAW Games' "Mini-Dungeon Monthly" a monthly RPG zine for 5th Edition D&D. Part of the Kickstarter #zinequest initiative, backers can snag a yearly subscription to this new zine modeled after the classic RPG zines of yore. 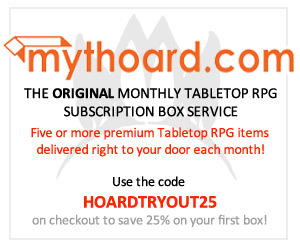 PDF with print option, and some amazing stretch goals including super high-resolution full color virtual tabletop (VTT) maps for every adventure in each monthly issue, digital NPC/Monster tokens, and more! I've done the cartography for these adventures as well as writing 1 to 2 adventures per issue. It's an exciting throwback to oldschool RPG zines with a modern 5E twist. Click here to check out the Kickstarter for this project! Or, visit 5Ezine.com for more information. 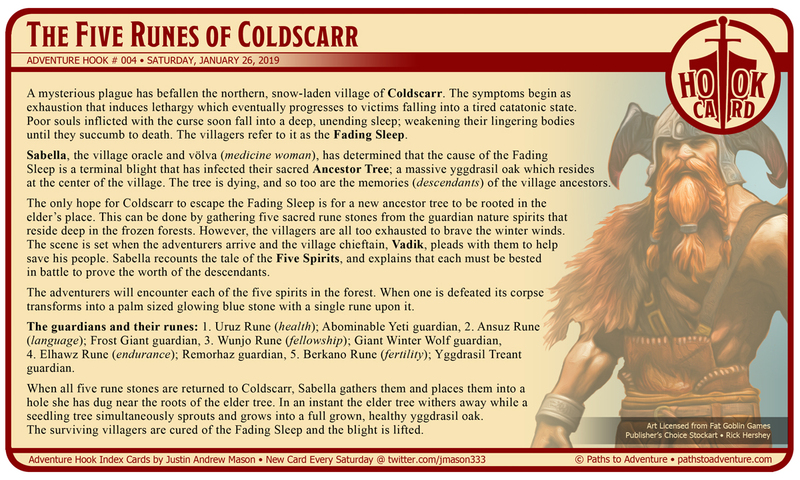 A mysterious plague has befallen the northern, snow-laden village of Coldscarr. The symptoms begin as exhaustion that induces lethargy which eventually progresses to victims falling into a tired catatonic state. Poor souls inflicted with the curse soon fall into a deep, unending sleep; weakening their lingering bodies until they succumb to death. The villagers refer to it as the Fading Sleep. Sabella, the village oracle and völva (medicine woman), has determined that the cause of the Fading Sleep is a terminal blight that has infected their sacred Ancestor Tree; a massive yggdrasil oak which resides at the center of the village. The tree is dying, and so too are the memories (descendants) of the village ancestors. 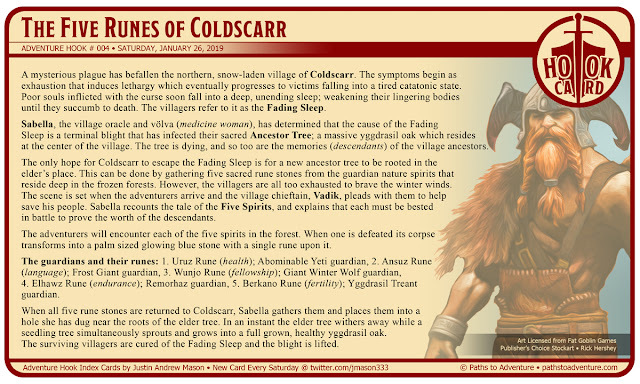 The only hope for Coldscarr to escape the Fading Sleep is for a new ancestor tree to be rooted in the elder’s place. This can be done by gathering five sacred rune stones from the guardian nature spirits that reside deep in the frozen forests. However, the villagers are all too exhausted to brave the winter winds. 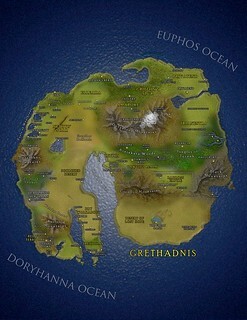 The scene is set when the adventurers arrive and the village chieftain, Vadik, pleads with them to help save his people. Sabella recounts the tale of the Five Spirits, and explains that each must be bested in battle to prove the worth of the descendants. The adventurers will encounter each of the five spirits in the forest. When one is defeated its corpse transforms into a palm sized glowing blue stone with a single rune upon it. The guardians and their runes: 1. Uruz Rune (health); Abominable Yeti guardian, 2. Ansuz Rune (language); Frost Giant guardian, 3. Wunjo Rune (fellowship); Giant Winter Wolf guardian, 4. Elhawz Rune (endurance); Remorhaz guardian, 5. Berkano Rune (fertility); Yggdrasil Treant guardian. When all five rune stones are returned to Coldscarr, Sabella gathers them and places them into a hole she has dug near the roots of the elder tree. In an instant the elder tree withers away while a seedling tree simultaneously sprouts and grows into a full grown, healthy yggdrasil oak. The surviving villagers are cured of the Fading Sleep and the blight is cured. These rings always come in matching pairs to be worn by two separate individuals. A ring of empathic bonding can be activated whenever the wearer wills it to be. Powered by the life-force of either wearer, the bonded rings enable the two users to share that essence as needed. There are two modes of activation: sending and receiving, and for a transfer to be completed both users must activate accordingly. By sending life-force, the sending user chooses between 1% and 20% of their current level of life-force, which is then sent directly to the wearer of the other ring. 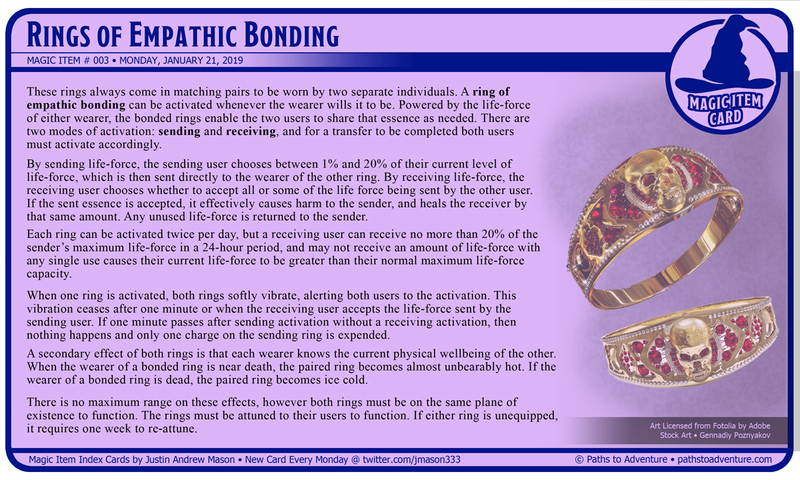 By receiving life-force, the receiving user chooses whether to accept all or some of the life force being sent by the other user. If the sent essence is accepted, it effectively causes harm to the sender, and heals the receiver by that same amount. Any unused life-force is returned to the sender. Each ring can be activated twice per day, but a receiving user can receive no more than 20% of the sender’s maximum life-force in a 24-hour period, and may not receive an amount of life-force with any single use causes their current life-force to be greater than their normal maximum life-force capacity. When one ring is activated, both rings softly vibrate, alerting both users to the activation. This vibration ceases after one minute or when the receiving user accepts the life-force sent by the sending user. If one minute passes after sending activation without a receiving activation, then nothing happens and only one charge on the sending ring is expended. A secondary effect of both rings is that each wearer knows the current physical wellbeing of the other. When the wearer of a bonded ring is near death, the paired ring becomes almost unbearably hot. If the wearer of a bonded ring is dead, the paired ring becomes ice cold. There is no maximum range on these effects, however both rings must be on the same plane of existence to function. The rings must be attuned to their users to function. If either ring is unequipped, it requires one week to re-attune. The adventurers have been requested by Lady Adelina of the Ainsworth estate to protect her family from a mysterious cult that has recently begun harassing them. Her daughter, Amelia, is aged eight. Her father, Harold, is sickly and in life’s twilight. The mansion is inhabited by the three of them along with a handful of simple servants. The Ainsworths are known to be a fantastically wealthy, and there’s no question that the Lady can afford the hefty payment that’s been offered in return for protection. 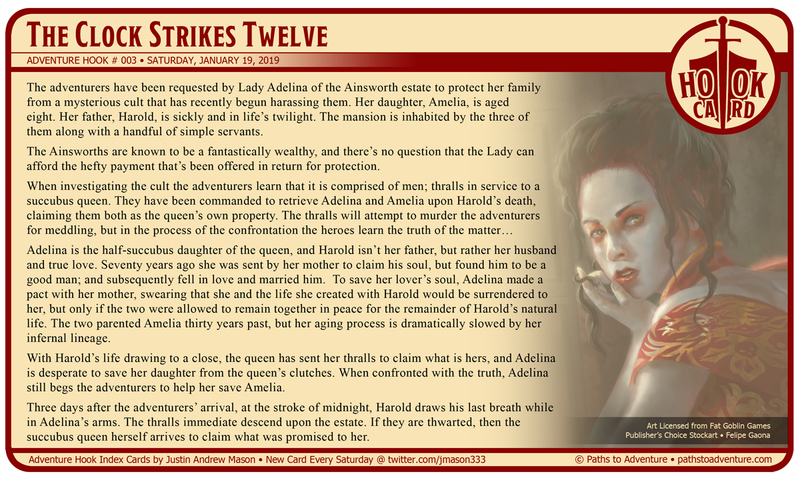 Adelina is the half-succubus daughter of the queen, and Harold isn’t her father, but rather her husband and true love. Seventy years ago she was sent by her mother to claim his soul, but found him to be a good man; and subsequently fell in love and married him. To save her lover’s soul, Adelina made a pact with her mother, swearing that she and the life she created with Harold would be surrendered to her, but only if the two were allowed to remain together in peace for the remainder of Harold’s natural life. The two parented Amelia thirty years past, but her aging process is dramatically slowed by her infernal lineage. With Harold’s life drawing to a close, the queen has sent her thralls to claim what is hers, and Adelina is desperate to save her daughter from the queen’s clutches. 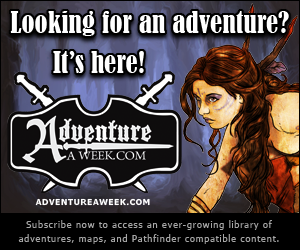 When confronted with the truth, Adelina still begs the adventurers to help her save Amelia. Three days after the adventurers’ arrival, at the stroke of midnight, Harold draws his last breath while in Adelina’s arms. The thralls immediate descend upon the estate. If they are thwarted, then the succubus queen herself arrives to claim what was promised to her. Another Kickstarter I designed just launched! Dark Naga Adventures' new hardback campaign "Haunting of Hastur" for 5E and OSR is now live! 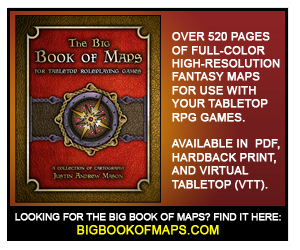 Check out this great book that encompasses an entire dark fantasy sandbox-style campaign. I contributed a ton of cartography to this series as well, and the collection of adventures is truly worthy of a hardback compilation. Don't miss out on getting your hands on this great hardback print! Click here to check out the Kickstarter for this project! 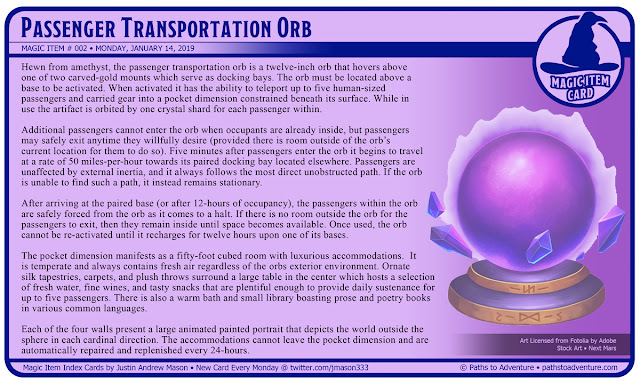 Hewn from amethyst, the passenger transportation orb is a twelve-inch orb that hovers above one of two carved-gold mounts which serve as docking bays. The orb must be located above a base to be activated. When activated it has the ability to teleport up to five human-sized passengers and carried gear into a pocket dimension constrained beneath its surface. While in use the artifact is orbited by one crystal shard for each passenger within. 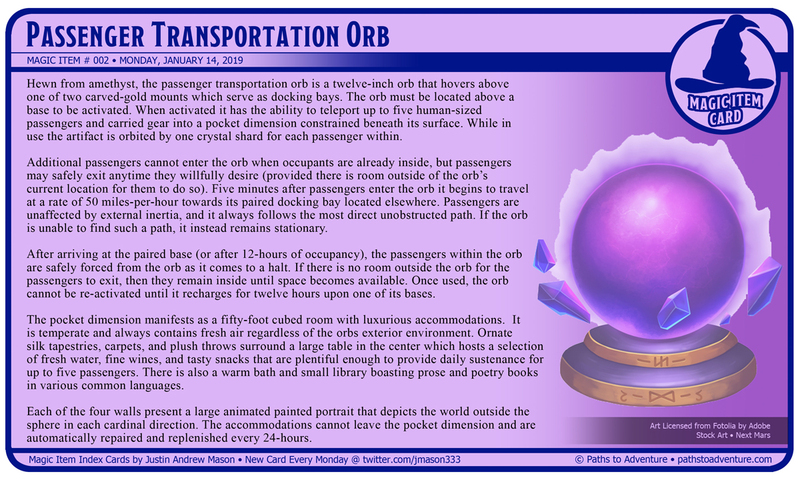 Additional passengers cannot enter the orb when occupants are already inside, but passengers may safely exit anytime they willfully desire (provided there is room outside of the orb’s current location for them to do so). Five minutes after passengers enter the orb it begins to travel at a rate of 50 miles-per-hour towards its paired docking bay located elsewhere. Passengers are unaffected by external inertia, and it always follows the most direct unobstructed path. If the orb is unable to find such a path, it instead remains stationary. After arriving at the paired base (or after 12-hours of occupancy), the passengers within the orb are safely forced from the orb as it comes to a halt. If there is no room outside the orb for the passengers to exit, then they remain inside until space becomes available. Once used, the orb cannot be re-activated until it recharges for twelve hours upon one of its bases. The pocket dimension manifests as a fifty-foot cubed room with luxurious accommodations. It is temperate and always contains fresh air regardless of the orbs exterior environment. Ornate silk tapestries, carpets, and plush throws surround a large table in the center which hosts a selection of fresh water, fine wines, and tasty snacks that are plentiful enough to provide daily sustenance for up to five passengers. There is also a warm bath and small library boasting prose and poetry books in various common languages. Each of the four walls present a large animated painted portrait that depicts the world outside the sphere in each cardinal direction. The accommodations cannot leave the pocket dimension and are automatically repaired and replenished every 24-hours. A thousand years ago the Kingdom of Uylgard was plagued by the curses of a powerful evil wizard named Zestanaran. The black mage sought to usurp the throne and subjugate the kingdom to his dark desires. One obstacle stood in his path: the king’s white wizard ally, Rikard. Despite efforts, the king was slain and the great castle fell under the rule of Zestanaran. Seeking vengeance for the murder of his king and friend, Rickard gathered the few remaining soldiers of the fallen kingdom and sieged the castle. 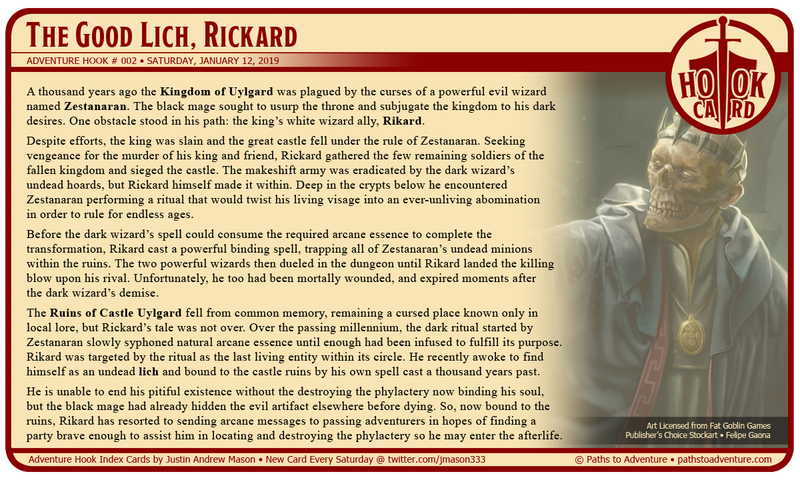 The makeshift army was eradicated by the dark wizard’s undead hoards, but Rickard himself made it within. Deep in the crypts below he encountered Zestanaran performing a ritual that would twist his living visage into an ever-unliving abomination in order to rule for endless ages. Before the dark wizard’s spell could consume the required arcane essence to complete the transformation, Rikard cast a powerful binding spell, trapping all of Zestanaran’s undead minions within the ruins. The two powerful wizards then dueled in the dungeon until Rikard landed the killing blow upon his rival. Unfortunately, he too had been mortally wounded, and expired moments after the dark wizard’s demise. The Ruins of Castle Uylgard fell from common memory, remaining a cursed place known only in local lore, but Rickard’s tale was not over. Over the passing millennium, the dark ritual started by Zestanaran slowly syphoned natural arcane essence until enough had been infused to fulfill its purpose. Rikard was targeted by the ritual as the last living entity within its circle. He recently awoke to find himself as an undead lich and bound to the castle ruins by his own spell cast a thousand years past. He is unable to end his pitiful existence without the destroying the phylactery now binding his soul, but the black mage had already hidden the evil artifact elsewhere before dying. So, now bound to the ruins, Rikard has resorted to sending arcane messages to passing adventurers in hopes of finding a party brave enough to assist him in locating and destroying the phylactery so he may enter the afterlife. Carved from thick, pristine quartz crystal, the magical alchemist’s vial has been fashioned for durability. Its near-translucent surface is difficult to scuff or scratch and is highly durable, withstanding most blunt force impacts that would shatter other vessels. The container is fire and acid resistant. It has been sized to contain enough liquid to fit one dose of the average size potion or elixir. It is capped with a sturdy cork that forms a magic seal, locking the contents within. When the vial is closed the user utters a password, and the container cannot be unsealed by normal means until the password is spoken again. 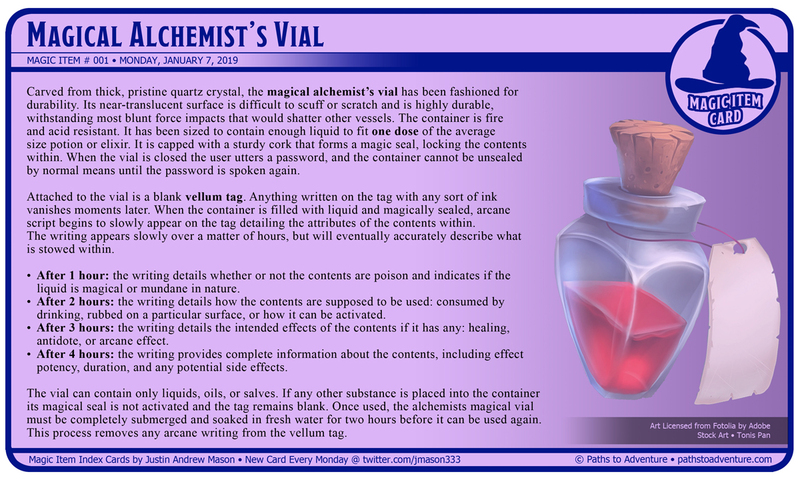 Attached to the vial is a blank vellum tag. Anything written on the tag with any sort of ink vanishes moments later. When the container is filled with liquid and magically sealed, arcane script begins to slowly appear on the tag detailing the attributes of the contents within. The writing appears slowly over a matter of hours, but will eventually accurately describe what is stowed within. After 1 hour: the writing details whether or not the contents are poison and indicates if the liquid is magical or mundane in nature. After 2 hours: the writing details how the contents are supposed to be used: consumed by drinking, rubbed on a particular surface, or how it can be activated. After 3 hours: the writing details the intended effects of the contents if it has any: healing, antidote, or arcane effect. After 4 hours: the writing provides complete information about the contents, including effect potency, duration, and any potential side effects. The vial can contain only liquids, oils, or salves. If any other substance is placed into the container its magical seal is not activated and the tag remains blank. Once used, the alchemists magical vial must be completely submerged and soaked in fresh water for two hours before it can be used again. This process removes any arcane writing from the vellum tag. January 2019 Exclusive Dungeon Crate VTT Map Set Released! My exclusive January 2019 virtual tabletop map set for Dungeon Crate is ready to roll. Subscribers can find a new VTT map set and other digital goodies in every month's digital crate (included as part of the monthly subscription). 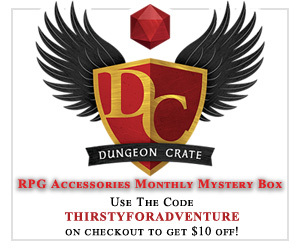 Check out DungeonCrate.com to find out more about getting a monthly box chock full of amazing tabletop RPG resources mailed directly to your doorstep. 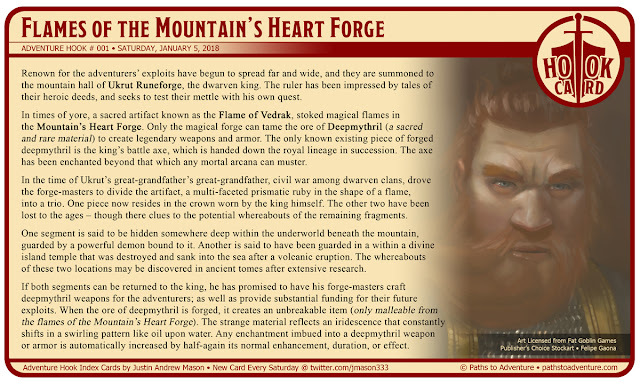 Renown for the adventurers’ exploits have begun to spread far and wide, and they are summoned to the mountain hall of Ukrut Runeforge, the dwarven king. The ruler has been impressed by tales of their heroic deeds, and seeks to test their mettle with his own quest. In times of yore, a sacred artifact known as the Flame of Vedrak, stoked magical flames in the Mountain’s Heart Forge. Only the magical forge can tame the ore of Deepmythril (a sacred and rare material) to create legendary weapons and armor. The only known existing piece of forged deepmythril is the king’s battle axe, which is handed down the royal lineage in succession. The axe has been enchanted beyond that which any mortal arcana can muster. In the time of Ukrut’s great-grandfather’s great-grandfather, civil war among dwarven clans, drove the forge-masters to divide the artifact, a multi-faceted prismatic ruby in the shape of a flame, into a trio. One piece now resides in the crown worn by the king himself. The other two have been lost to the ages – though there clues to the potential whereabouts of the remaining fragments. One segment is said to be hidden somewhere deep within the underworld beneath the mountain, guarded by a powerful demon bound to it. Another is said to have been guarded in a within a divine island temple that was destroyed and sank into the sea after a volcanic eruption. The whereabouts of these two locations may be discovered in ancient tomes after extensive research. If both segments can be returned to the king, he has promised to have his forge-masters craft deepmythril weapons for the adventurers; as well as provide substantial funding for their future exploits. When the ore of deepmythril is forged, it creates an unbreakable item (only malleable from the flames of the Mountain’s Heart Forge). The strange material reflects an iridescence that constantly shifts in a swirling pattern like oil upon water. Any enchantment imbued into a deepmythril weapon or armor is automatically increased by half-again its normal enhancement, duration, or effect.